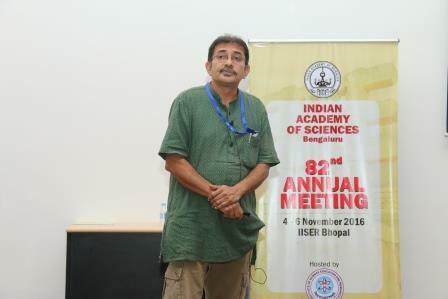 The three-day 82nd Annual Meeting of the Indian Academy of Sciences, hosted by the Indian Institute of Science Education and Research, Bhopal, saw enthusiastic participation of members of the scientific and teaching community across the nation, with 91 Fellows and Associates of the Academy and 41 invited teachers attending the event. 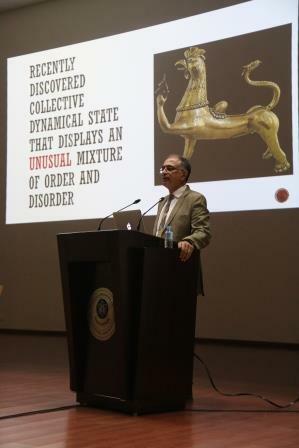 ­­­­­­The event began with the Presidential Address by Ram Ramaswamy (JNU, New Delhi), who spoke on ‘Chimeras: A spontaneous emergence of dynamical disorder’. Chimeras are the spontaneous emergence of a dynamic state with a mix of order and disorder. He spoke of his work on the physical and mathematical models for Chimeras in various systems, and the significance of Chimeras, particularly in biological processes such as uni-hemispheric sleep and ventricular fibrillation. A special attraction of the first day of the meeting was the launch of CNR Rao’s book A Life in Science, published by Penguin India. The book captures his long academic journey spanning 65 years and the trials and tribulations of a career in Science. Rao mentions, in his book, several of his heroes in Science and how they have been a constant source of inspiration to him. He hopes the book will make Science as dear to the reader as it is to him. 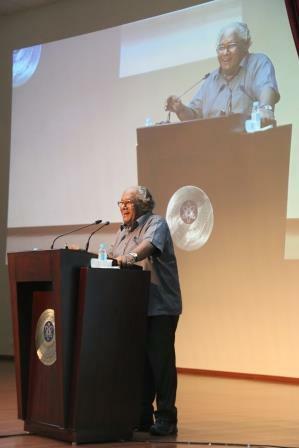 A public lecture by CNR Rao on “How India Can be a World Leader in Science” followed. He spoke of how Science was receiving insufficient funding in India, which is one of the reasons why India’s contribution was fairly small. He advised students to choose good problems to work on. He said that the mindset of Indian society should change to one which places the highest value on science and education. He regaled the students of IISER Bhopal in a jam-packed auditorium with stories of Raman and Faraday, who despite adversities changed the face of science. 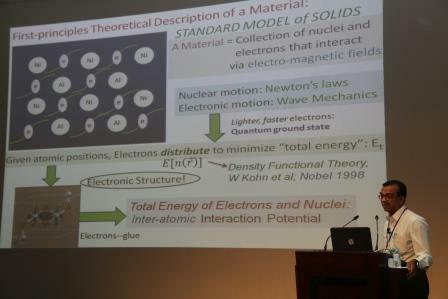 In this series of Inaugural Lectures by the newly elected Fellows and Associates of the Academy, the first session began with a presentation by Arun Chattopadhyay (IIT, Guwahati), who spoke on an interesting new study that deals with complexation reaction on the surface of the quantum dot. The chemical reaction between the labile surface metal ion and an external organic ligand results in the formation of inorganic complexes on the quantum dot which not only alters the property of the quantum dot but also confers additional properties. This finds potential applications in chemical catalysis, light-emitting devices, medical imaging, solar cells, lasers and electronic devices. Sanjib K Agarwalla (IOP, Bhubaneswar) discussed the three-flavour oscillation picture of neutrinos in light of the recent discovery of the smallest lepton mixing angle. He also spoke of the projects to be handled by the India-based Neutrino Observatory. Autoimmune diseases have considerably increased globally, and treatments using non-steroidal anti-inflammatory drugs, corticosteroids, disease-modifying antirheumatic drugs, and immunosuppressive agents are associated with limitations and side effects. Javed N Agrewala’s (IMTECH, Chandigarh) group has verified the role of Caerulomycin A – a bacterial compound with antifungal and antibiotic properties – as a new drug to cure arthritis. Using animal models, they found that CaeA restrains arthritis symptoms by inducing the generation of Tregs and suppressing pro-inflammatory factors. They have patented their technology. Starting with some of the classical examples of special values of L-functions, A Raghuram (IISER, Pune) conveyed the grandeur of this subject that draws upon several different areas of modern mathematics such as representation theory, algebraic and differential geometry, and harmonic analysis. 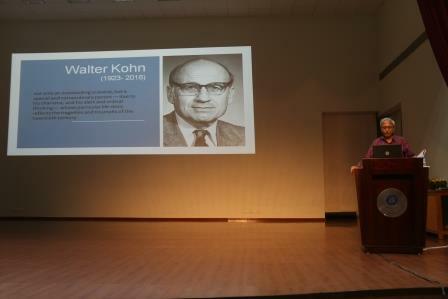 Commemorating the contributions of Noble Laureate Walter Kohn, whose work has revolutionized the understanding of electronic properties of materials, a special ‘Walter Kohn Memorial Symposium’ was conducted on the first day of the meeting. HR Krishnamurthy (IISc, Bengaluru) chaired the session and presented a brief life timeline of Noble Laureate Walter Kohn. 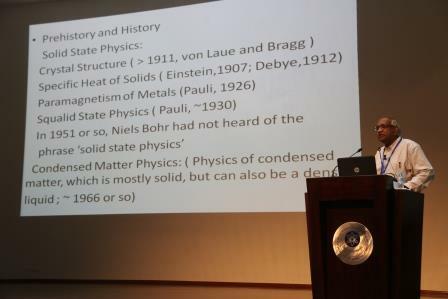 TV Ramakrishnan (BHU, Varanasi) traced the history and origin of the field of condensed matter physics and the crucial role that Walter Kohn played in the evolution of the field from obscurity to present prominence. 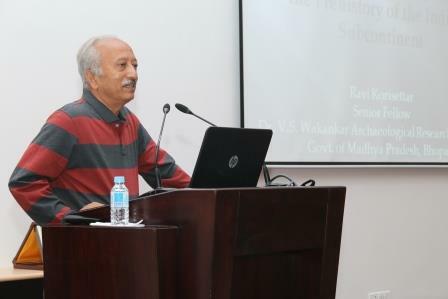 Presenting an overview of the work by various researchers, Ramakrishnan highlighted the contributions of Walter Kohn in various aspects of electron theory of solids. Tracing the history of density functional theory which arose from the single-particle electron density idea proposed by Walter Kohn, Swapan K Ghosh (BARC, Mumbai) discussed how, despite the differences in the nature of the density variables used in various DFT-based descriptions, the corresponding theoretical frameworks, share a unified structure. Ghosh elaborated on some of the developments and applications of DFT in diverse areas of chemistry and physics. 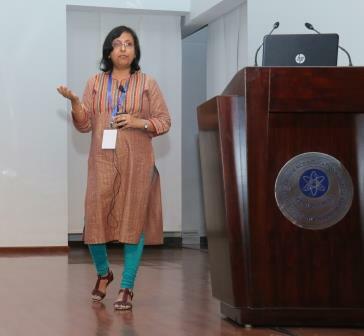 Tanusri Saha-Dasgupta (SNBNCBS, Kolkata) spoke about specific situations when the conventional DFT proves insufficient to predict the properties of materials. In such situations, DFT along with the Coulomb correlation, namely Hubbard U, and DFT along with Dynamical Mean Field Theory or DMFT are used. The effectiveness of these methods through applications in describing charge-ordered insulators and correlated metals was described. Umesh V Waghmare (JNCASR, Bengaluru) discussed his work on deciphering the interesting relationship between Wannier functions and non-Abelian Berry phases of Bloch electrons. The idea is centrally relevant to the nontrivial electronic topology exhibited by topological insulators, Weyl and Dirac semimetals. 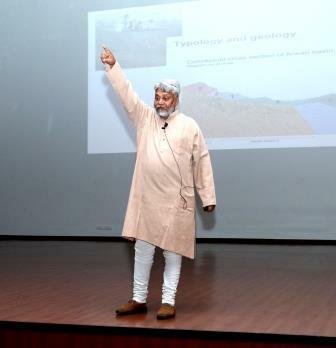 The first day concluded with a very inspiring talk by renowned water conservationist and Stockholm Water Prize and Magsaysay Awardee, Rajendra Singh, from Tarun Bharat Sangh. Preferring to talk in Hindi, he spoke passionately about how traditional water management systems, now long forgotten, would effectively meet the rising demand for water of today. He spoke of his experiences in Rajasthan, where, by use of traditional methods, several rivers that had dried up were now perennial. The methods used were unique to each agro-ecological zone, thus ensuring sustainability the river. He appealed to scientists to use their technology in conjunction with indigenous knowledge systems to come up with strategies to ensure the rivers of India be saved and remain the life-giving forces they are. He concluded on an ominous note that if we did not act now to save our rivers, the world would see a water war soon. The second day began with a special lecture on Academic Ethics by Sunil Mukhi (IISER, Pune). Based on the document on Scientific Values prepared under the aegis of the Academy, he spoke on what ethics means. He elaborated on the contents of the document, with special emphasis on how to conduct research ethically. He focussed on publication ethics, by providing various definitions of plagiarism. He talked about how to paraphrase without plagiarising. He ended his talk with actions publishers must take towards spotting plagiarised papers. Continuing the series of Inaugural Lectures by Fellows and Associates of the Academy, Pradyut Ghosh (IACS, Kolkata) spoke on his work on anion recognition by synthetic receptors, which finds application in water purification processes and industrial and nuclear waste reprocessing. A wide variety of receptors (ligands) containing different anion recognition elements with increasing complexities have been developed by the speaker’s team. Their recent work deals with (i) selective sensing of phosphates; (ii) separation of hydrated metal sulphates/potassium bromide; and (iii) halogen-bonding-assisted bromide removal. Starting with Shannon’s noisy channel coding theorem, Ankur A Kulkarni (IIT, Bombay) spoke about the open question about finite blocklength performance and the existing solutions. His group used convex relaxations and linear programming duality to obtain lower bounds for problems in information theory, which has resolved open issues about the role of Shannon theory in stochastic decentralized control and a 60-year-old open combinatorial problem posed by Levenshtein for the deletion channel. Some of the most energetic events in the Universe are the explosive transients – gamma-ray burst sources (GRBs), supernovae and novae. GC Anupama (IIA, Bengaluru) spoke on the observational properties of these sources and mentioned the facilities that will be coming up in the next decade to observe these phenomena: the Large Synoptic Survey Telescope (LSST) and the Giant Segmented Large Telescopes. Cellular stress response is a general term referring to a wide range of molecular changes that cells undergo in response to environmental stressors, including extremes of temperature, exposure to toxins, and mechanical damage. S Ganesh (IIT, Kanpur) spoke of his group’s finding that Sat3 transcripts are required for the full protection from heat-shock-induced cell death, and that the loss of these transcripts leads to a partial relief of heat-shock-induced transcriptional repression. Tuberculosis (TB), caused by Mycobacterium tuberculosis (Mtb), afflicts about one-third of the world population. KN Balaji (IISc, Bengaluru) spoke of the ability of Mtb to strategize host miRNAs for inhibition of autophagy and to plant host epigenetic modifiers for generation of foamy macrophages, so as to create a haven in the hostile environment offered by the host. Charge is transferred between the atoms in a Quantum Dot (QD). The transferred charge resides in a quantum confined state. The Quantum Dot electronic structure can be approximated remarkably well as a Spherical Particle in a Box problem. The formation mechanisms and the reasons behind the emergence of atom-like characteristics in QDs were described by Anshu Pandey (IISc, Bengaluru). QDs react the same way as atoms and their “chemistry” allows the synthesis of stoichiometric compounds, he added. Various examples of chemical reactions between QDs and also the energetics of such reactions were described. The recent decades have seen unprecedented developments in the field of biological sciences. Armed with novel tools and next-generation sequencing technologies biologists are delving deep into the molecular realms of life. The buzzword in this context has been the microbiome. Celebrating these achievements of biological sciences and the focusing on the science of microbiome a special symposium on “Our Second Genome” was organised on the second day of the meeting. 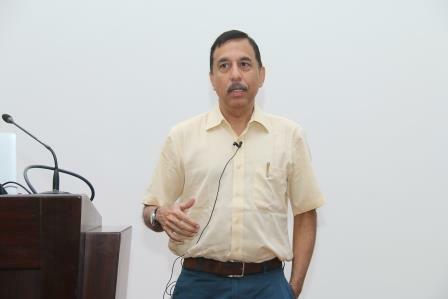 Tracing the origin and history of the discipline of microbiome Partha P Majumder (NIBMG, Kolkata) introduced the audience to the emerging field of microbiome also highlighted the microbiome diversity in human systems. He discoursed the need of understanding the relationship of “our second genome” with that of our own genome and gave an overall view of the novel insights on microbiome especially in the context of human health and well-being. The gut microbiome is related to many human disorders including diabetes and cardiovascular disorders. They are even known to play a major role in antibiotic resistance and bioavailability of drugs. 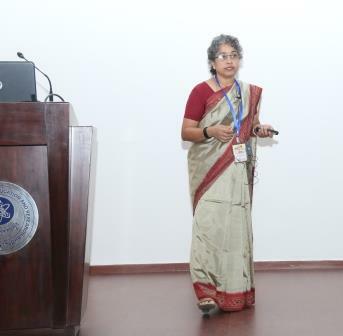 Sharmila S Mande (TCS, Pune) discussed the composition and functions of the microbiome of the human gut and the challenges in estimating the taxa diversity, identity and genes of gut microbes. An end-to-end metagenomics platform is being developed by her team to analyse the microbiome data generated from various sequencing platforms. Their study will give important clues to the differences in gut microbiome across age, environment, and population, opening up novel avenues of translational and personalized medicine. 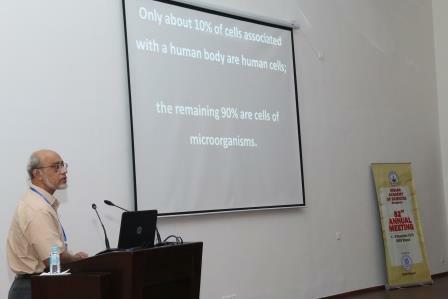 Vineet K Sharma (IISER, Bhopal) discussed his metagenomics studies of healthy and diseased individuals in Indian population. The links between gut flora and disorders such as malnourishment, tuberculosis, and mental disorders highlight the need to develop robust platforms to analyse microbiome. Novel metabolic capabilities of human gut flora involved in the metabolism of different food substrates and xenobiotics were revealed during the speaker’s analyses. Microbiome is not restricted to the gut. In fact, microbes are dominant in skin, the largest organ of the human body, and have direct implications for skin health. Souvik Mukherjee (NIBMG, Kolkata) focused on his work on the characterisation of facial skin microbiome in the Indian population of Dravidian descent. Shekhar C Mande (NCCS, Pune), proposing a large-scale study on the Indian population and microbiota highlighted the need of “The Indian human microbiome initiative”. The large-scale project is conceptualized to address some of the fundamental questions related to the effect of microbiota on human health, especially in the context of the Indian population. Mande outlined the study design and coordination plan for the collaborative initiative which aims to cover 90 communities and 20,000 subjects across various geographic regions with the objective of mapping of microbiota five different body sites. The second day of the meeting ended with a public lecture by Ravi Korisettar from Dr VS Wakankar Archaeological Research Institute, who took the audience on a virtual geological tour with his talk on the importance of the Vindhya basin in the prehistory of the Indian subcontinent. The speaker traced the journey of early human beings (Homo erectus) from Africa to the Indian subcontinent. Highlighting the importance of Vindhya basin in studying the pattern of dispersal of ancient humans in India, he presented the evidence gathered from various Paleolithic sites in the Vindhya basin which help researchers understand the migration and habitation pattern of early humans in India and the factors that aided this. 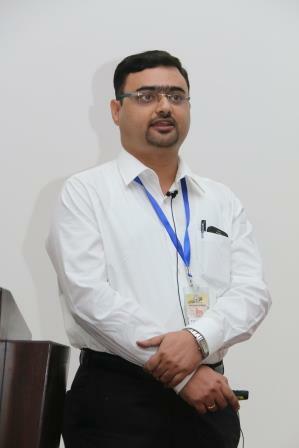 The third day’s Inaugural Lectures began with Krishna P Kaliappan (IIT, Mumbai). He outlined the novel procedures developed by his team to synthesize complex compounds such as vinigrol, taxol, and N-heterocyclic amides through a minimum number of steps to achieve ideal synthesis. The molecules are considered crucial because of their biological activity and the newly developed methods overcome many drawbacks of the conventional synthesis techniques of such molecules. 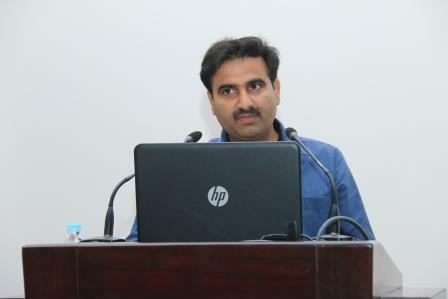 Appa Rao Podile (UoH, Hyderabad) shared his research, elaborating on the process of plant immunity triggered upon infection by pathogens and the progress made towards understanding this process. A major player in such immunity involves chitooligosaccharides released during plant-fungal interactions which elicit plant defence. The speaker discussed his work on identifying enzymes like chitinase(s), which help in the chemical process of transglycosylation and generation of long-chain chitooligosaccharides which triggers immunity. In the recent years, CRISPR-Cas technology has emerged as one of the most robust molecular biology techniques ever developed. B Anand (IIT, Guwahati) explored how bacteria integrate phage fragments to acquire immunity in the CRISPAR-Cas pathway. His work on how the pathway involving various complexes confers heritable adaptive immunity to bacteria serving as immunological memory was discussed. Analytic functions are extremely important in physics, chemistry, electrical engineering, etc. Tirthankar Bhattachrya (IISc, Bengaluru) explained what analytic functions were with several illustrations such as the disc and bidisk formulae, and the transfer function used in input-output systems by engineers. Low-temperature scanning tunneling spectroscopy has emerged as one of the most powerful tools to study electronic properties of solids at low temperature, with unsurpassed spatial and energy resolution. Pratap Raychaudhuri (TIFR, Mumbai) spoke of the basics of this technique and the low-temperature scanning tunneling microscope developed in TIFR. Evolution and extinction of life are tied intimately to the seawater chemistry. Reconstruction of the temporal changes in the redox state of seawater is crucial in understanding the trace elemental inventory of oceans and its influence on the biosphere. 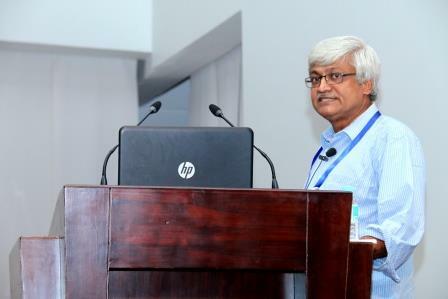 G R Tripathy (IISER, Pune) spoke of his work on the 187Re-187Os systematic of organic-rich marine sediments, which uniquely provides reliable information for their depositional age and past marine chemistry. 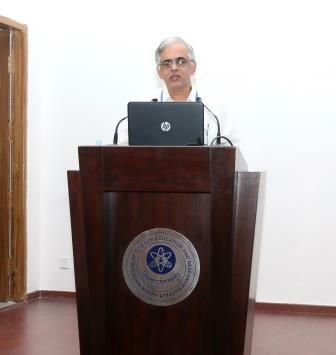 The 82nd Annual Meeting concluded with a special lecture on ‘Experimental ecology and evolution in the laboratory’ by Amitabh Joshi (JNCASR, Bengaluru). The opportunities offered by experimental ecology and evolution studies in laboratory settings aid the study of evolutionary and ecological mechanisms, which are otherwise not possible in the wild. What makes Drosophila the ideal biological model to answer questions at the interface of ecology and evolutionary biology was highlighted in his research on various aspects of heredity, development, and ecology of Drosophila populations. These studies illustrated how the evolutionary process is far more subtle and responsive to minor changes in ecology than often perceived.